A Top of the Pops 2 special featuring music from the 90s. Includes performances from The Spice Girls, Michael Jackson, Pulp, The Prodigy, Madonna, Blur, Take That and many more. Browse content similar to TOTP 2 Presents the 90s. Check below for episodes and series from the same categories and more! We slip round the back of the millennium to reflect on the '90s. We look at the superstars of the decade - TOTP2 presents the '90s. They're all here - Noel and Liam, bad boys when they were good. Spice Girls - very eager to please in 1996. And Michael Jackson tried to save the world before being blown away. But first, 1994 - it's anthemic. 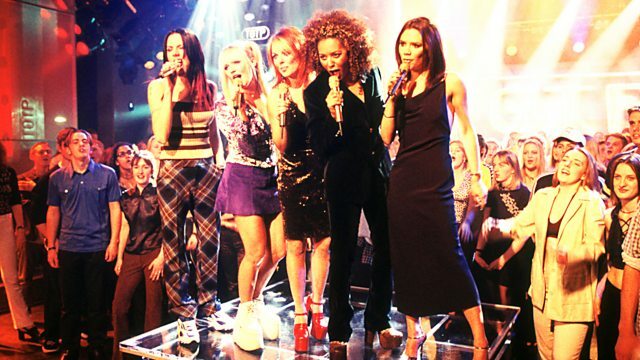 Things Can Only Get Better, and now they do - this is the performance that started off the Spice Girls. I wanna really really really wanna zigazig ah! # What do you think about that? -# Are you for real? Now, here comes Michael Jackson, caught in a mistral. # What have we done to the world? # That you pledge your only son? # What about flowering fields? # Is there a time? # That you said was yours and mine? # All the children dead from war? # This crying earth, this weeping shore? # Hey, what about yesterday? # What about the seas? # What about the bleeding earth? # Can't we feel its wounds? # What about nature's worth? # Have we lost their trust? # What about crying whales? it's our TOTP2 special presenting the '90s. Here comes a stick man, a skeleton - Jarvis, you're on TOTP2! # Deborah, do you recall? # Won't it be strange when we're all fully grown? # Oh, Deborah, do you recall? # Did you notice me at all? # What are you doing Sunday, baby? # Would you like to come and meet me, maybe? Don't you wish you had as much energy as that drummer? Now, 1990. Jam hot. This is jam hot. this man is merely an actor, not a real arsonist. This is our TOTP2 New Year's Eve special. when he says, "We're on Top Of The Pops." And yes, there is a snake around Lauryn Hill's neck. Can I get a snap? Yo, what did he do? Say "one time" a lot and you can turn any classic into rap. It's the hits of the '90s on TOTP2. Now, 1990 and another reinvention for Madonna. for artistic purposes and not for titillation. If you don't want to know the score, look away now. Madonna. Now Take That - Wash Your Back For Good. Now Jay Kay, the hat. TOTP2 presenting the '90s. We're up to 1997 now. Still no sign of Puff Mummy(!) 1998. Damon's not as cool as you think. He's wearing eye make-up just like a big girl. It ain't over till the fat bloke raps. I'm living life, do or die, what can I say? # That the ones we hurt are you and me? That's why I know my life is outta luck, fool! but nine years later, I think we love it again. I had no idea Robin Hood was an American and Friar Tuck a Canadian. Now a song from 1993 - Gabrielle. # Do you hear what I'm saying? The start of Gabrielle's career. That's not even a patch on her other songs. 1996 now - the Manics. The Manics. Now Shania. Have you ever seen a more beautiful woman? # So you got the brains But have you got the touch? # But have you got the touch? # You must be jokin', right? # So you got the moves but have you got the touch? # You think you're cool But have you got the touch? No tigers were killed for that dress - they were already dead. That's almost it for this special edition. TOTP2 will be right back next millennium. See you next century. Happy new year from all of us at TOTP2. # A better place to play? A Top of the Pops 2 special featuring music from the 90s, with archive studio performances and promo videos. Includes performances from The Spice Girls, Michael Jackson, Pulp, The Prodigy, Madonna, Blur, Take That and many more.